This article is about Falco's appearance in Super Smash Bros. Brawl. For the character in other contexts, see Falco Lombardi. Falco (ファルコ, Falco) is a character appearing in Super Smash Bros. Brawl. He was confirmed to return as a playable character on February 20, 2008. Falco is no longer voiced by Hisao Egawa in all regions of the game; he reprises his role in the Japanese version, but he is now voiced by Dex Manley in the English versions of the game. Falco is currently ranked 7th out of 38 on the tier list, the lowest position of the A- Tier and top tier, and a slight drop from his Melee tier placement, where he was 2nd overall. Falco's Blaster shots are very fast, hard to punish, very long-ranged, transcendent, and allow him to camp and punish approaches easily. At low percents, Falco can rack up damage quickly using lasers and his down throw chain grab with many follow-ups such as the Gatling Combo or the meteor smash in his down aerial. He also has incredible vertical mobility, fast attack speed, a strong all-purpose attack in his back aerial, the aforementioned down air meteor smash (the fastest meteor smash in Brawl with only 5 frames of startup lag), a long-ranged Reflector, and other tricks such as his BDACUS. Falco still has significant problems, however. While his vertical mobility is excellent, his horizontal mobility is sub-par as Falco has lackluster dashing speed and air speed. Falco can have difficulty KOing his opponents who can survive his meteor smash offstage from his chain throw, possessing few reliable KO moves that are not particularly powerful and stale quickly (made worse by the fact that some of his finishers are used frequently). Falco also has a poor recovery; while his Falco Phantasm provides great horizontal distance, it can be predictable and leaves Falco vulnerable for the duration of the move, allowing opponents to easily hit him out of it. Additionally, his Fire Bird travels a short vertical distance, has a very small ledge sweetspot, and is easily edgehogged. His fast falling speed also hinders his recovery, and the fast acceleration of it makes him vulnerable to chain throws from characters like Pikachu who can chain throw him from low percentages to a KO. Regardless of his disadvantages, Falco still has a large amount of favorable matchups, having only three disadvantageous ones, and has achieved very strong tournament results. Have Falco join the player's party in the Subspace Emissary (The Swamp). With the exception of the third method, Falco must then be defeated on Lylat Cruise. A demonstration of Falco following up his down throw chaingrab with a down aerial meteor smash. Falco has a diverse moveset featuring quick attacks, great follow-up ability, capable finishers, the ability to wall jump, the highest initial jump in the game, and a fantastic projectile. Outside of his forward aerial, all of his aerials cancel quickly upon landing, including his down aerial. Falco's Blaster has great range, transcendent priority, and decent speed. The ending lag of aerial blaster shots also cancel quickly upon landing. This gives him an incredible ability to approach or shutdown approaches, as short-hopped Blaster cancels can be immediately chained into many of Falco's other attacks at close or mid range. Although he has a great camping game, he also has a very good close-range game. He has a very fast jab which is can be used to rack up damage or set up for a grab, and his spot dodge is one of the fastest in the game. Falco can also bolster his approach with his dash attack, a quick, strong move that is difficult to defend against. Falco has a chance to forcibly trip opponents with his quick down special, Reflector to further harass their approach due its great range, although it is unsafe on shields and spot dodges due its fairly long ending lag and low amount of shield stun. Reflector can go through walls and also has the ability to reflect uncommon projectiles, such as Pikachu's Thunder. It can also be used in conjunction with his blaster to safely disrupt recovering opponents from a distance. One of Falco's most potent moves is his down throw. Although impractical for KOs, it instead provides Falco with an excellent and easy to use chain-throw, chaining into itself up to damage percentages as high as 50% on most characters including the down aerial finish, and it affects more characters than King Dedede's down throw chain. When Falco gets to the edge during the chain-throw, he can unavoidably meteor smash opponents to their doom; should they be able to recover, he can simply edge-hog at the right time to prevent their return (on some characters, it doesn't work against most characters). This attack chain is particularly fatal to all the space animals, including himself, due to the delay and movement limitations in their up specials, though Fox can still recover thanks to his buffed up midair jump in the form of Rising Fair. Falco's down throw also combines well into down aerial and dash attack, and a popular alternative finish to the chain-throw is the Gatling Combo where Falco will hit with dash attack before instantly canceling into an up smash. As for characters on which he cannot initiate his chaingrab, his down throw still makes for a good setup move as he can follow up the throw with a wide range of attacks from his arsenal, such as his neutral and down aerials, side smash, DACUS, Blaster, Reflector, jab, and forward tilt. However, Falco's grab range is sub-par at best and as such, he can have trouble grabbing nimble characters who can potentially out-camp him such as Meta Knight or Fox, who would otherwise be helpless against Falco's chain grab. It should be noted though that if Falco lands close to his opponents after successfully connecting a short hopped double laser, he is almost guaranteed a free grab. For finishing moves, one of Falco's lackluster areas, Falco can use his forward and up smashes to good effect, though his forward smash is slow and is weak in the tip (although it has a fast charge release, has fairly long range and the hitbox lasts some frames with the weak hitbox being during the last frames). His up smash has strong, purely vertical knockback if it hits during the upswing of his kick, and can be used as a DACUS to gain the jump on opponents further away, though its hitboxes have poor range. The hitboxes of the latter portion of Falco's up smash have little knockback and cannot KO below 200%. However, at high percentages, it acts as a somewhat effective semispike, which can prove fatal to opponents with poor recoveries. Falco is also armed with a fast and powerful meteor smash in his down aerial that can KO at percentages as low as 50%. However, although this move has a slight horizontal disjoint, it has little range with only a small sweetspot the very start on the move spikes, and sourspotting the attack knocks back horizontally with fairly low knockback and lasts a long time while in the air, which makes it dangerous to use off the edge given Falco's fast falling speed. Falco's down aerial excels at spikes near the edge and at spiking opponents above the stage, setting them up for punishment or even a different finisher as they get up from the floor. Falco also has an infinite in the form of his laser lock which can be set up up somewhat easily with his down aerial or down throw followed by a buffered jab (see the techniques section below for more thorough information). It can also potentially set up KOs from his BDACUS. Falco's major weaknesses lie in recovery and finish ability. Although Falco Phantasm (side special) gives moderately good horizontal distance, Fire Bird (up special) has very short distance, leaves Falco vulnerable during the charge, and is easily edgeguarded, and its only real use is recovering from below or diagonally. His falling speed has some hindrances, such as making him a candidate for Pikachu's 0%-100% chain-grab (although he has resistance against chain-grabs that are ineffective against lightweights such as King Dedede's down throw chain-grab). Although planking can pose a problem for Falco, this issue is ameliorated in the tournament scene where it's usually limited or banned altogether. The main causes of Falco's poor finish ability stem not from a lack of KO moves, but rather his difficulty in landing them, particularly against quick, mobile characters, due to the fact that some of his moves used for racking up damage also happen to be his only KO moves, have poor range, and stale when his foes get within KO percentages, and his forward smash has its aforementioned power though slow start-up and ending lag. Other than his recovery and poor finishing ability, Falco has no critical problems. Smart, experienced Falco players have overcome these setbacks with his defense and adaptability. Unlike in Melee where Falco was a clone of Fox, Falco's moveset received a massive overhaul, to the point where is now a semi-clone rather than a full clone. While Falco is still a top tier character in Brawl, he has been significantly nerfed from Melee with little to no compensation, albeit to a lesser extent than Fox. His overall endurance has been worsened; his much slower falling speed and the changes to knockback formula have made him more frail despite his increased weight, similar to Fox. His Reflector has lost a lot of its utility: it can no longer be jump-cancelled, and the changes to hitstun have removed his high damaging combos and KO setups from Melee. Falco's overall KO power has been weakened, as his back aerial, down tilt, and forward smash are weaker. Down aerial is slightly stronger during its early hitbox; however, it now only meteor smashes during the first few frames, instead of throughout the whole move, similarly to how it was in the PAL version of Melee. Also, due to the removal of spikes, it is now meteor-cancellable, significantly worsening its KOing potential. Falco's new moves have overall poorer utility than their previous iterations. Neutral aerial is less effective for approaching, pressuring, and comboing, forward aerial has very high landing lag, and up aerial deals less damage and is weaker. Forward smash's sweetspot is hard to land. His already poor recovery has been both buffed and nerfed: he can maneuver more effectively offstage due to his lower falling speed and faster air speed, and Falco Phantasm goes farther, but Fire Bird travels an even shorter distance than before. However, Falco has received notable buffs. His grab game has better utility. Down throw can no longer be teched by opponents, and allows for easy and highly damaging chain-grabs, partially making up for the loss of his Shine combos. The addition of the DACUS gives Falco a new and reliable approach option, and aids his damage racking ability. The more defensive gameplay in Brawl has indirectly boosted his already strong camping game; the loss of several mobility options makes it much harder to overcome Falco's Blaster, and he has gained a few notable laser techniques, and he can also fire two lasers from a short-hop. Despite his numerous nerfs, Falco still remains more effective than the majority of the cast since most other veterans were heavily nerfed to various degrees, as well as him being less affected by the transition of Melee's physics to Brawl's compared to other characters. Similar to Fox, Falco's design is based off his appearance in Star Fox Command. The boost in graphics also gives Falco much more detail. Falco's Blaster now fires blue lasers instead of red. Falco has a new running animation. Falco is slightly heavier (80 → 82). However, like Fox, due to Brawl's changes to the knockback formula (knockback is now also based on a character's gravity), Falco's vertical endurance is still drastically worse, to the point he has the 14th worst vertical endurance out of 39 characters with momentum canceling, whereas in Melee, he had the 3rd best vertical endurance out of 26 characters. Falco walks slower (1.4 → 1.28). Falco dashes slower (1.5 → 1.432). Falco's initial dash is faster (1.82 → 1.9). Falco's air speed is slightly faster (0.83 → 0.893). Falco's additional air acceleration is higher (0.05 → 0.07), increasing the total amount (0.07 → 0.08) despite his base air acceleration being lower (0.02 → 0.01). Relative to the cast however, it has gone from the 3rd highest to the 20th highest. Falco's traction is lower (0.08 → 0.065), going from the 7th highest in Melee to the 9th highest. Compared to the returning veterans, however, Falco's traction is higher, making it easier for him to punish out of shield. As with the returning veterans, Falco's falling speed is drastically slower (3.1 → 1.708). Compared to the returning veterans, however, Falco falls much slower going from having the highest falling speed to the 6th highest, improving his recovery and making him less vulnerable to combos, while drastically weakening his vertical endurance despite being heavier. Falco's gravity is lower (0.17 → 0.112) going from the second highest to the 4th highest. Jumpsquat is one frame slower (5 → 6 frames). Falco has a new neutral attack, where he chop-slashes with one wing after the other, then spins quickly while leaning forward stationary with a single wing out to repeatedly slash the opponent. Neutral attack's first two hits have a longer duration (frames 2-3/3-4 → 2-5/3-6), more vertical range due to their new animations, and set knockback (0 → 5 (hit 1)/20 (hit 2)). Additionally, the first hit launches at a higher angle (70° → 80°), and with the introduction of SDI multipliers in Brawl, has received a below-average multiplier (0.5×), while the neutral infinite has shorter gaps between hits (7 → 5 frames), set knockback (10 (base)/80 (scaling) → 3 (set)/100 (scaling)), and different angles as well (80° → 30°/50°/80°). Altogether, these changes allow the move to connect all hits more reliably. Neutral attack can no longer be jab canceled into other moves, due to its set knockback and the first hit having more ending lag (frame 16 → 17). The second hit also deals less damage (4% → 2%). Neutral attack, up tilt and forward smash now have a slash effect instead of a normal effect. Forward tilt has a shorter duration (frames 5-9 → 6-8) and more ending lag (frame 26 → 28). Falco has a new up tilt, where he swings both of his wings above his head in a tip-toed turn. Compared to the previous up tilt, it hits twice, with its damage values redistributed (9% → 4%/3% (hit 1)/5% (hit 2)). Up tilt has better vertical reach, and faster startup with a longer duration overall (frames 5-11 → 4-9 (hit 1)/12-16 (hit 2)). New up tilt has less horizontal range behind Falco, and can no longer combo due to its higher ending lag (frame 23 → 37) and the introduction of hitstun canceling. The first hit has also received a sourspot, while the second hit deals less knockback due to its lower individual damage output, despite its knockback scaling being increased (120 → 150). Down tilt deals less damage with a sourspot at the tip of Falco's tail (13% → 12%/9%), and has drastically less knockback scaling (125 → 90), no longer being a reliable KO move (KOing around 170% rather than around 100% in Melee). Dash attack has more base knockback (35 (clean)/20 (late) → 40/30). Dash attack's angle has been altered (72° → 65° (clean)/40° (late). Falco has a new forward smash, where he swings his wings forward in an overhead swipe. Forward smash's late hit has a much larger hitbox (3.6u/3.2u/2.4u → 9u)). With the addition of hitlag multipliers in Brawl, the move has also received below-average multipliers (0.5× (clean)/0.3× (late)), making it harder to DI. Forward smash has more startup with a shorter duration (frames 12-21 → 17-22), more ending lag (frame 40 → 51), deals less damage (17% (clean)/14% (late) → 15%/10%) and has less knockback scaling (90 (clean)/105 (late) → 88/90), hindering its KO potential and no longer being one of Falco's most reliable KO options. Its clean hit was also moved closer to his body, making it harder to land without a hard read, despite the longer overall reach of the forward smash. The introduction of the DACUS turns Falco's up smash into a much better approach and followup option, as well as a quick move that can deal damage in excess of 20% at lower percentages (via the Gatling Combo). Its late hit also deals more knockback (10 (base)/100 (scaling) → 18/98). Up smash has more startup (frame 7 → 8) and no longer grants intangibility on Falco's head. Its clean hit also has less knockback (25 (base)/100 (scaling) → 20/98), although this is mitigated by the generally slower falling speeds in Brawl. Down smash has more startup with a shorter duration (frames 6-10 → 7-9), more ending lag (frame 46 → 47), deals less damage on its sweetspots (16% → 15%), and has less range, greatly decreasing its utility. Combined with the loss of intangible frames on the leg hurtboxes when charging, it is less effective as an edgeguarding option. All aerials except forward aerial have decreased landing lag (15/7 frames → 9 (neutral), 20/10 frames → 15 (back), 18/9 frames → 15 (up), 18/9 frames → 12 (down)). Due to the removal of L-canceling, however, their landing lag is not fully compensated. Falco has a new neutral aerial, where he does a single tumbling spin swipe with his wings to his right. Compared to the previous neutral aerial, it hits four times, with its damage values redistributed (12% (clean)/9% (late) → 3% (hits 1-2)/2% (hit 3)/4% (hit 4)). Neutral aerial has less startup (frame 4 → 3) and more range behind Falco. Neutral aerial has a shorter duration (frames 4-31 → 3-5, 6-9, 14-17, 21-24), more ending lag (frame 42 → 49) and autocancels later (frame 37 → 43). Due to consisting of multiple hits with angles that do not link very well (361° → 110° (hits 1-3)/361° (hit 4)), it is less reliable overall, as opponents can easily SDI out of it, and it cannot lead into other moves as effectively as his previous neutral aerial. Furthermore, it has less range in front of Falco, and its last hit deals less knockback due to its lower individual damage output, despite its base knockback being increased (10 → 40), leaving it unable to KO until very high percents. Falco has a new forward aerial, where he spins in a horizontal corkscrew to perform a drilling peck, similar to Pikachu and Sonic's forward aerials. Forward aerial now consists of a loop hit with a rehit rate of 8, and a last hit, rather than five separate hits, giving it a consistently active hitbox (frames 6-8, 16-18, 24-26, 33-35, 43-45 → 6-33 (loop)/34-35 (last hit)) and thus making it easier to hit. Its loop hit additionally uses the autolink angle (361° → 365°), and both its hitlag multiplier (0.7×) and SDI multiplier (0.8×) are below-average, allowing the move to connect all hits more reliably. Forward aerial has more ending lag (frame 53 → 58) and much more landing lag (22 → 33 frames), making it very risky to use close to the ground. It also deals less damage (9%, 8%, 7%, 5%, 3% (hits 1-5) → 2% (loop)/3% (last hit)), and has less knockback for both the loop hits (10 (base)/100 (scaling) → 0/40) and last hit (50 (base)/100 (scaling) → 80/60), allowing opponents to shield or air dodge out of it until high percents, and hindering its KO potential. Furthermore, the last hit has received an above-average hitlag multiplier (2×), making it easier to DI. Forward aerial now has a slash effect instead of a normal effect. Back aerial's late hit has more base knockback (0 → 30). Back aerial's clean hit sweetspot and late hit deal less damage (15% (clean)/9% (late) → 13%/7%), weakening the former despite its slightly increased knockback scaling (100 → 103). Falco has a new up aerial, where he performs a frontflip kick. Compared to the previous up aerial, it only hits once instead of twice. Up aerial is easier to connect with due to consisting of a single hit, and has more horizontal reach. Up aerial has more startup with a shorter duration (frames 8-9, 11-14 → 10-14), deals less damage (6% (hit 1)/10% (hit 2) → 11%), and its sweetspot has less knockback (22 (base)/120 (scaling) → 27/100), reducing its KO potential. The move also has less vertical range. Up aerial's angles have been altered (70°/90° → 68°/80°). Down aerial's clean hit deals more damage (12% → 13%), improving its KO potential. The move also autocancels earlier (frame 30 → 27), allowing it to autocancel in a short hop, and can be used more safely offstage due to Falco's much slower falling speed. Down aerial can now be meteor canceled, and no longer meteor smashes with the late hit (290° → 361°). While the latter was also the case in the PAL version of Melee, the clean hit in Brawl has a much shorter duration as well (frames 5-14 (clean)/15-24 (late) → 5-7/8-21), making the move harder to meteor smash with, although it remains one of Falco's most powerful edgeguarding options. The late hit also deals less damage (9% → 8%) with less knockback scaling (100 → 90). Down aerial's clean hit's angle has been altered (290° → 280°). Pummel is faster (24 → 16 frames). Pummel deals less damage (3% → 2%). All of Falco's throws are no longer weight dependent. Back throw launches at a lower angle (56° → 33°), improving its edgeguarding ability despite its knockback scaling being decreased (85 → 80). Back and up throws deal more total damage (7.46% → 8%) due to the changes to stale-move negation. Up throw has less knockback (75 (base)/110 (scaling) → 70/100). Up throw's angle has been altered (90° → 107°). Down throw's shots deal more damage (1% → 2%), which along with the changes to stale-move negation increases the move's total damage (4.73% → 9%). It also launches at a different, non-meteor smash angle (270° → 50°), and has less knockback (150 (base)/40 (scaling) → 45/130), allowing it to chain grab from low to mid percents. Down throw's different angle removes its ability to tech-chase, hindering its setup potential past mid percents, especially with the changes to hitstun. This also removes its ability to one-hit KO at the ledge if the opponent did not meteor cancel. Slow edge attack deals more damage (8%/6% → 10%). Falco can no longer fast fall while firing lasers, hindering his ability to control their height precisely. In particular, Falco can no longer short hop laser lower than a grounded laser and cannot fire consecutive low lasers as frequently. This makes his lasers less effective for pressuring and approaching since he cannot get to the ground as quickly after firing them. However, it remains one of his best options, still gives him among the best neutrals in Brawl, and is still considered one of the best moves in the game. Falco can now shoot two lasers in a short hop, making them better for tacking on damage, especially against aerial opponents. The lock mechanics in Brawl also allow them to rack up damage very effectively via laser locking. Furthermore, due to powershielding no longer reflecting projectiles, lasers are safer to use for camping. Falco Phantasm travels significantly farther; combined with Falco's slightly faster air speed and slower falling speed, this makes it a noticeably better horizontal recovery option overall. Falco Phantasm's meteor smash hitbox is weaker. Fire Bird now has hitboxes while charging, akin to Fire Fox, significantly decreasing its startup (frame 43 → 20) and allowing it to deal much more total damage (16% → 33%). Its last hit also has a much larger hitbox (4.096u → 10u). Fire Bird travels a shorter distance and causes Falco to lose all momentum after using the move, drastically lowering his already slow air speed until he lands. The dashing portion of the move now also consists of nine hits instead of a single hit, which have redistributed damage outputs (16% → 3% (hit 1)/2% (hits 2-9)), knockback that doesn't properly match Falco's travel speed (30 (base)/50 (scaling)), and an above-average SDI multiplier (1.5×), while the last hit launches at a lower angle (80° → 361°) and its knockback was barely compensated (80 (base)/60 (scaling) → 70/90). This makes the move much harder to connect, despite the dashing portion's second to eight hits using the autolink angle (80° → 365°), and leaves it unable to KO until very high percents, removing nearly all its offensive utility. Reflector now behaves differently: Falco kicks his reflecting device forward, and it then comes back to him as if magnetized, instead of him activating and holding it in place like Fox's version of the move. Due to its different behavior, Reflector has more horizontal range and its hitbox lasts longer (frame 1 → 4-13). It also reflects projectiles immediately (frame 4 → 1) without incurring additional lag upon reflection, deals shield damage (0 → 5), has received a below-average hitlag multiplier (0.5×) making it harder to react to, and cannot be SDIed (0×). Reflector no longer grants intangibility, no longer stalls in midair, and cannot be extended, instead having a set duration with more ending lag than when not extended in Melee (frame 40 → 51). Due to its different behavior, it also cannot reflect projectiles from behind. Furthermore, it can no longer be jump canceled, and its hitbox has more startup (frame 1 → 4), deals less damage (8% → 6%), and launches at a lower angle (84° → 361°) with less knockback (110 (base)/50 (scaling) → 35/30), removing Falco's shine combos entirely, which were his most lethal form of punishment in Melee. While it has gained a trip chance of 40%, its ending lag is too high for it to be followed up on, while making it unsafe on hit if it does not trip. Altogether, these changes significantly weaken the move's utility. Falco now has a Final Smash: Landmaster. Falco's Landmaster is visually identical Fox's Landmaster, but it has better air mobility, a higher jump, weaker cannon shots, a more damaging barrel roll, and slower ground speed. After 18 seconds, Falco's Landmaster will disappear. 4% Falco does a jab, another jab, and then tilts diagonally and spins very quickly with his arms out. 9% Kicks his leg out. Can be angled. 4% (hit 1), 3% (hit 1 tip), 5% (hit 2) Swings both of his wings above his head in a tip-toed turn, hitting twice. Good for racking up damage. 12% (near), 9% (far) A quick tail swipe. It has lost KO power from Melee, but still deals high knockback. 9% (clean), 6% (late) Jumps slightly off the ground while running and performs a kick. 15% (clean), 10% (late) Brings his wings back behind himself and slam-chops with them in a forward lean, slashing anyone who is caught in it. High knockback. 14% (clean), 12% (late) A bicycle kick. Weaker than Fox's up smash but better for juggling. Moderately high knockback. 15% (feet), 13% (legs) A split kick that comes out relatively quickly. His legs are intangible for a short time before the attack strikes. 3% (hits 1-2), 2% (hit 3), 4% (hit 4) Does a series of spinning swipes with his wings, hitting four times. The final hit knocks opponents away. 2% (hits 1-4), 3% (hit 5) Turns horizontally and spins, hitting multiple times with his beak, similar to Pikachu's or Sonic's forward aerial. All hits deal small knockback excluding the last hit, which deals slightly more knockback. The move has a long duration with landing lag, making it dangerous to use in most situations. 13% (clean sweetspot), 9% (clean sourspot), 7% (late) A backwards kick. Good knockback scaling. 11% An overhead vertical flip kick. Deals more knockback with Falco's legs than with his body. 13% (clean), 8% (late) Turns diagonally and spins. At the start of this attack, the hitbox from his knee to his lower body, can execute a spike at his spinning heel. Extremely fast start-up with barely any landing lag but can be considered a dangerous off-stage move due to Falco's fast falling speed. 2% A quick knee strike. 4% (hit 1), 3% (throw) Bashes the opponent forward. 2% (throw), 2% (shots) Throws the foe backwards and then fires three shots with his Blaster. 2% (throw), 2% (shots) Throws the foe upwards and fires three shots with his Blaster. Nearly useless at higher percentages due to it being easy to DI out of, allowing the opponent to avoid all laser shots. 2% (shots), 1% (throw) Tosses opponent upward, then fires four very quick Blaster shots. It can chain grab most characters at low percentages, and may be finished with a down aerial meteor smash at the edge of the stage. Falco can also finish chain grabs with a DACUS to deal as much as 60% damage in total. 6% Falco lunges and kicks backwards and forwards. 6% Falco extends to attack in front and in back. 5% Falco spins around, kicking those who are near. 6% (legs), 8% (body) Falco lunges at the opponent with a kick. 10% Falco slowly gets up and hammers the ground with a kick. Blaster 3% Falco fires his blaster. Unlike Fox's Blaster, it is slow but does stun the opponent. It fires faster when used in the air. Falco Phantasm 7% (ground), 6% (airborne opponents when used in air) Falco dashes forward, leaving an afterimage behind him. Unlike Fox Illusion, Falco Phantasm launches opponents downwards and has slightly less startup. Fire Bird 2% (charging loop), 3% (launch hit 1), 2% (launch hits 2-9) Falco charges up and suddenly fires himself in any direction, depending on what direction is held. The attack hits multiple times. Reflector 6% (reflector), 1.5x damage for reflected projectiles Falco activates his Reflector and kicks it away from him, reflecting any projectiles and shocking any enemies it comes in contact with. Can be used as a poking tool that trips low-damage opponents. Landmaster 5-19% (movement), 15-16% (turn), 13% (shot), 13% (roll), 14% (fall) Falco summons his Landmaster. It has more aerial mobility than Fox's, but is slightly weaker and has less ground mobility. Silent Lasering: A silent laser refers to canceling the ending lag of a single blaster shot by short hopping and using his Blaster instead of using it in the ground. This allows Falco to SHDL and combo a laser into an up smash, DACUS, or BDACUS for a KO. Another interesting advantage to this technique is that a perfectly performed silent laser will cancel about 6 frames of the blaster's landing lag. This will allow Falco to land in front of his opponents and grab them before they can spot dodge. He can proceed to start his trade mark, deadly chain grab combos. It should be noted that this will not work if the blaster is stale, as a stale silent laser will only cancel 4 lag frames. Laser Cancelling: Using Falco's Blaster before touching the ground cancels landing lag and shortens response time upon landing. The optimal timing is noticeable because Falco will draw his laser, but not fire a shot. This is used for mind games, because of its look of Falco immediately becoming neutral. It is more useful for flail recovery than tapping the shield button upon landing because there are no frames on landing, and Falco is able to attack more quickly. In Melee, the response time reduction is more significant, but it lacks in flail recovery. In Brawl, the flail recovery is better, but the response time reduction is almost unnoticeable. They both cancel flail (assuming the player has control) equally. Laser lock: Some of Falco's moves have enough hit stun to cause opponents to bounce on the ground. If one's reflexes allow it, Falco can use his lasers to trap opponents in the bouncing animation, effectively giving him a potent and inescapable lock. Ejects from an upside-down Arwing. Falco is one of only four characters to speak in all three taunts in Brawl, the others being Zero Suit Samus, Peach and Pikachu (though Peach uses real words in two of her taunts, and Pikachu, like most Pokémon, only ever says variations of its name). 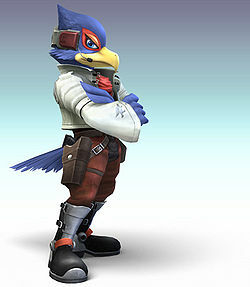 Additionally, in the English version, Falco speaks in his taunts with a Brooklynese Italian-American accent (his surname, Lombardi, is Italian). Smash taunt: On Lylat Cruise or Corneria, Falco can summon various Star Fox Conversations by quickly tapping down on the Control Pad (for one frame). This taunt can only be used once per match. Slightly turns to the side. Moves his hand in front of his face. Fal - Co! Fal - Co! Falco says "Piece of cake!" like one of his taunts. This victory theme comes from the main theme of Star Fox 64. Up: Jumps extremely high and lands kneeling. He then looks up at the camera. Left: Rapidly kicks and says "Had enough already?" (くたばるのはまだ早いぜ。, Too early to kick the bucket just yet.) Then puts his foot down and crosses his body over to look at the camera. According to the current SmashBoards matchup chart, Falco's matchup spread has the fourth highest unweighted rank, fourth highest total (tied with Marth), and sixth highest weighted total. Falco is countered in two matchups, soft countered by one matchup, and has seven even matchups. He soft counters ten characters, counters nine characters, hard counters six characters, and has one close-to-unloseable matchup. He does have trouble against some other top/high tiers, being countered by Ice Climbers, whom Falco lacks safe options to approach without getting grabbed (allowing their 0-death chaingrab), and Pikachu, who can take advantage of his fast falling speed acceleration attribute by chaingrabbing him (if started at 20%, which can be reached with two forward throws, it can also buffer down throws and finish with a Thunderspike, as a 0-death combo). Falco is one of the few characters to have an arguably even matchup against Meta Knight, due to his ability to projectile camp against him, though this is stage specific, with him only coming close on neutral stages, specifically Final Destination. One major disadvantage against said character is that he can easily be gimped and edgeguarded. Larry Lurr - Widely considered to be the best Falco player in the world. Masha - Considered to be one of Japan's two best Falco players, along with SLS. SLS - Considered to be one of Japan's two best Falco players, along with Masha. Falco has always been seen as a top-tier character in Brawl, though he is ranked slightly lower in the most recent tier lists than in the previous ones. Falco was ranked 5th place on the first tier list (September 2008) in the top tier, and rose to 3rd in the second (January 2009; his highest position so far). He then remained at 4th from the third tier list to the sixth, before dropping to 6th on the seventh (April 2012), then 7th on the eighth and current list, as of April 2013. While Falco has had many notable players contributing to his metagame, as well as having always had great matchups against the majority of the cast, he does have trouble against some top/high tiers, and his less successful recent tournament results hold him back, though he still remains a top tier character. Ejecting from his Arwing, Falco shows up just in time to save Fox from trophyization at the hands of Bowser and a Shadow Bug clone of Diddy Kong by flip-kicking the Dark Cannon from Bowser's hands and destroying it with dual lasergun fire, forcing Bowser to leave. He is shown to use two blasters, but only uses one when he is used in-game. This makes Falco the only character who destroys a Dark Cannon in SSE, no matter which princess the player rescues. The Diddy clone begins to absorb more Shadow Bugs, becoming gigantic, and after Fox revives the real Diddy, the three fight the giant clone. Falco then turns to leave, but is dragged back by Diddy and reluctantly comes along. A stupefied Fox shrugs his shoulders and walks off after them as he received the same treatment from Diddy earlier. As Captain Falcon and Captain Olimar look down at the ship carrying Donkey Kong's trophy, Falco's Arwing shows up, ejecting Diddy Kong from the cockpit. Diddy then activates his Rocket Barrel Jet Pack and shoots the ship with his Peanut Popguns. Landing on the ship, he quickly detrophifies DK, and after DK, Diddy, Captain Falcon, and Olimar defeat the Primids that board the ship, Falco gives Diddy and Donkey Kong a thumbs up as he leaves. He makes his next appearance in the battle against Duon on the Halberd, where he teams up with Fox, Peach, Zelda, Snake, and Lucario. When it's defeated, Peach revives Mr. Game and Watch as Meta Knight takes back control of his ship. He uses his Arwing during the attack on the Subspace Gunship and maneuvers effectively to avoid the cannons. He enters Subspace and stands loftily, as if he is above this. When he is turned into a trophy, he is rescued by Luigi, Ness and Dedede, and joins them in the Great Maze. He aids them in the fight against Tabuu. After Outside the Ancient Ruins is finished, Falco will be removed from the player's team until the Duon battle in Battleship Halberd Bridge. These stickers can only be used by Falco or a select few including him. Event 32: Bird in Darkest Night: As Falco (with a dark alternative costume), the player must defeat Mr. Game & Watch on Brinstar. The stage gets dark very frequently throughout the match. Event 34: All-Star Battle Melee: Falco is one of the opponents fought in this event. All opponents are newcomers from Super Smash Bros Melee. Event 38: The Wolf Hunts the Fox: As Wolf, the player must defeat Fox and Falco on Lylat Cruise. Co-Op Event 19: Shadow of Andross: Fox and Falco team up to defeat Wolf on Lylat Cruise while an Andross assist trophy is used against them. Falco's main and Final Smash trophies can be obtained by clearing Classic Mode and All-Star mode respectively with Falco. Falco's up and down smashes have the lowest uncharged base knockback of all the uncharged up and down smashes. Strangely, the Prima game guide gives Falco a "10" ranking on speed, even though his dash speed is actually only average (although his walking, falling, and attack speed are among the fastest). The lasers fired during Falco's up, down and back throws can be reflected, and damage Falco instead, if his opponent is wearing a Franklin Badge. All of Falco's smash attacks can hit on both sides of him. Owing to his thick Brooklyn accent in the English dub of Brawl, Falco's down taunt, where he says "Hands off my prey", is thought to sound like "Hands off my bread" to a number of players; this inspired a number of jokes, image macros, and references in the Smash community. Falco is the only character who has a codec conversation that does not feature Colonel Roy Campbell, Otacon, or Mei Ling; instead, his Codec Conversation features Slippy, who is implied to have hacked onto Colonel's channel. Falco's page at Smash Bros. DOJO!!. This page was last edited on February 17, 2019, at 07:27.